Not to be confused with Avengers vs. X-Men. "AXIS" (also known as "Avengers & X-Men: AXIS") is a 2014 comic book storyline published by Marvel Comics. Cover for Avengers & X-Men: AXIS #1 (October 2014). From the ashes of the once proud mutant haven Genosha, the supervillain Red Skull manages to harness the abilities of the world's most powerful telepath Professor Charles Xavier and the being Onslaught, to enslave thousands, amass an army and broadcast his message of hate across the world. The fractured teams of Avengers and X-Men are now all that stands in the Red Skull's way. Preceding the event in September are the "March to AXIS" tie-ins involving the titles of Captain America, Loki: Agent of Asgard, Magneto and Uncanny Avengers. Magneto enters the island of Genosha to find that it had turned into a concentration camp for mutants. He frees two mutant girls who tell him that Red Skull is responsible and possesses Professor X's brain. Magneto attacks Red Skull, but is quickly stopped by the Skull's S-Men. Magneto is captured and telepathically tortured by Red Skull. He is given visions of those closest to him suffering while being unable to do anything to stop it. After being freed by Scarlet Witch, Rogue, and Havok, he bites down on a vial beneath his skin of Mutant Growth Hormone, giving himself enough power to fight. Havok, Rogue, and Scarlet Witch are captured by the Red Skull's S-Men and sent to his concentration camp in Genosha. Rogue (who still has Wonder Man inside her) is able to break the group free. They discover Magneto has been captured, and free him, as well. The three want to leave the island and alert the rest of the Avengers and X-Men of what Red Skull is doing, but Magneto says he's going to stay and fight. Before they can do anything, Red Skull appears. Red Skull now has the group mind-controlled. He plans on using Scarlet Witch's power to shape reality in his image. He tells Magneto to bow if he wants his daughter to remain alive, but Magneto performs a sneak attack enough to break Red Skull's control over the others. In a fit of rage over finding mutants being used for freak medical experiments, Magneto kills the entire S-Men team. Magneto then attacks Red Skull, all while Skull tells Magneto that Professor X's greatest fear was him leading the X-Men. Magneto kills him, while the others look on in horror. Magneto believes everything is over only for Red Skull to reappear as a giant called Red Onslaught. After defeating and imprisoning Loki, Doctor Doom discovers his countrymen attacking each other and threatening to overthrow him. Doom begins to feel the effects of the Red Skull's global telepathic assault, realizes the assault is the cause of the Latverian riots, and casts a spell that renders him telepathically immune. Valeria and Verity Willis free Loki, who ultimately stops the Red Skull's telepathic attack. Red Skull tells Arnim Zola that everything is in place on his end. Zola is confronted by his daughter Jet who refuses to return to her father's side. Falcon sneak attacks Zola. Ian finds and frees Sharon Carter, only to learn that Zola has a bomb strong enough to destroy all of New York City. Falcon removes the telepathic antenna on Zola's body to stop him from controlling the bomb, but it only sets it to activate. Falcon takes the bomb high into the sky above New York before it goes off. Red Onslaught used his powers to spread hate across the world, influencing the Avengers with his "World War Hate." After Iron Man rescued the team, the Avengers attempted to locate the source of the telepathic attack. Meanwhile, Magneto, Rogue, and the Scarlet Witch fought Red Onslaught in Genosha later joined by the Avengers and the X-Men. Iron Man used a telepathic dampener to stop the Red Skull's influence. When more heroes arrived to help, Red Onslaught revealed that he influenced Stark to create a model of Sentinels, based on the knowledge of different super heroes he acquired after the Civil War before erasing the latter's memories of constructing them. Red Onslaught then deployed his Stark Sentinels to fight the heroes. With the appearance of the Stark Sentinels, the tide of the battle was quickly turned to Red Onslaught's favor. Using their opponents' own strengths against them, the Sentinels countered the heroes, bathing them in Pym Particles to shrink them and hold them prisoner. Rogue came up with a plan to defeat the Skull, proposing that Doctor Strange and the Scarlet Witch cast a spell to invert the axis of Red Skull's brain and bring out the fragment of Professor X to defeat Onslaught. The plan didn't work due to Nova's inexperience. Scarlet Witch and Doctor Strange were targeted and captured by the Sentinels before they could cast the spell. As Magneto fled from the battle, the heroes hid in Genosha where they were hidden with the help of Quentin Quire. After coming to, Iron Man organized a last attempt to defeat the Sentinels, but failed and was left the last one standing. Red Onslaught told him he had seen into his mind, and that he was a sociopath fueled by competition, but his boast was interrupted by the return of Magneto. Magneto was accompanied by a group of villains (consisting of Absorbing Man, Carnage, Deadpool, Doctor Doom, Enchantress, Hobgoblin, Jack O'Lantern V, Loki, Mystique, and Sabretooth) he had recruited to fight the Stark Sentinels as they were not able to properly counter villains as well as heroes. The villains managed to defeat one of the Sentinels, which allowed the heroes trapped inside to break free. Doctor Doom and Scarlet Witch attempted to cast the inversion spell again, and Red Onslaught was knocked unconscious and reverted to his Red Skull form. The other Stark Sentinel was defeated afterwards, freeing the heroes inside as the villains had left the scene. Before Red Skull could wake up to reveal whether Charles Xavier was now in control or not as the X-Men wanted, Steve Rogers and the Avengers decided to be cautious and take Red Skull to Stark Tower. This caused Havok to resign from the Unity Division while telling Steve Rogers that Cyclops was right about him. Havok then sides with the now-unified X-Men and his brother Cyclops with whom he reconciled. Days later, S.H.I.E.L.D. gathered Captain America to discuss what was going to become of the Red Skull, now that the Stark Sentinels had been dismantled and the concentration camps torn down. Nick Fury, Jr. tried to convince Captain America to hand him over, but under the influence of the inversion spell, Wilson was violent and punched him before leaving saying that Fury mistaken him for Steve and that "He's not that Captain America". Meanwhile, in Brooklyn, a family held hostage by the Squid was saved by the now-heroic Carnage. Spider-Man arrived on the scene shortly after Carnage had left, and to his surprise found the Squid defeated and the family unharmed. Carnage also left a small piece of paper with his face drawn on it, with the words "from your friendly neighborhood Carnage." Spider-Man said that the note is both disturbing and verging on copyright violation. In San Francisco, Iron Man arrived at the San Francisco Giants' stadium where he presented his new digital version of the Extremis, free for every citizen of the city to achieve perfection. Matt Murdock was among the crowd, and noticed that Tony had started drinking once more. At the Jean Grey School, the X-Men revealed their new agenda of no longer wanting co-existence between humans and mutants, but to stand above them with the help of Evan Sabahnur, who had become Apocalypse due to the inversion. Back at the Avengers Tower, Captain America informed the team about the current whereabouts of the X-Men. In response to the mutants' announcement, the Avengers decided to kill the Red Skull, even if that might destroy any chance of finding a piece of Professor X's soul inside him. Both Hulk and Edwin Jarvis tried to stop them, but were ignored and attacked. This caused a new persona to surface in the Hulk called Kluh, who proceeded to attack the Avengers and then flee the Tower, planning to cause destruction. After deciding that Kluh was not their problem as long as he didn't stand in their way, the Avengers opened the Red Skull's cell—only to find that it was empty. Following the Red Skull's escape, Captain America called a meeting in the Avengers Tower of all the heroes available who were or had been Avengers. After informing the guests about the Red Skull's disappearance, Captain America told them that only somebody with Avengers clearance would be able to free him. Everyone in the room was a suspect. Spider-Man's spider-sense triggered, and he quickly escaped Stark Tower through the window, along with Nova. Captain America activated a button which sprayed all the heroes in the room with Pym Particles in order to be sent to Hank Pym's "ant farms." Spider-Man instructed Nova to fly them to safety, but they were attacked by Queen Medusa and Captain America. Spider-Man and Nova managed to escape with the help of Magneto. Magneto took Spider-Man and Nova to the Avengers Mansion, where Steve Rogers informed them about the effects of the inversion, including Kluh's rampage across Arizona. Nova took off to confront Kluh. At Avengers Tower, Captain America mused over the future of the world to Wasp (who he has hooked up to a machine that extracts her Pym Particles). Captain America said that the world needs a tyrant, and that he is the best candidate. The X-Men and Apocalypse arrived and attacked Avengers Tower, looking for the Red Skull. When they found that the Skull was gone, the X-Men brutally beat Captain America, proclaiming their intent to conquer New York—and issuing an ultimatum that all humans be evacuated from Manhattan within three hours or perish. After broadcasting a warning for humankind, the X-Men (who had created a gene bomb designed to kill those without the X-Gene in their body) were confronted by Mystique who attempted to make them see the errors of their ways. Rogue and Nightcrawler confronted her and forced her to leave with Sabretooth. Meanwhile, in San Francisco, Daredevil confronted Tony Stark about having unleashed Extremis and the problems it caused to society. Tony surprised Matt with increased agility and strength and beat him up before throwing him from his headquarters. In Latveria, Doctor Doom was attacked by the Scarlet Witch who wanted revenge for having tampered with her and indirectly caused M-Day. He was saved by Quicksilver and Magneto who stated that Scarlet Witch would never recover from killing Doom if she did so. In Las Vegas, Loki tried to unsuccessfully make his brother Odinson listen to reason and had to be saved by Steve Rogers, Nomad, and Spider-Man in the Quinjet. After returning with Loki to the Avengers Mansion, Steve revealed that he had assembled the solution to deal with the inverted Avengers and X-Men: he had reassembled the team of inverted supervillains that Magneto previously assembled into the Astonishing Avengers. As the Astonishing Avengers stormed Apocalypse's ship and fought the X-Men, Zenpool and Spider-Man attempted to sneak past Apocalypse and try to defuse the gene bomb. Zenpool attempted to distract Apocalypse while Spider-Man deactivated the device, but both failed and were thrown outside the ship where they joined the ongoing battle between the X-Men and the Avengers. Meanwhile, in Latveria, Scarlet Witch unleashed her power to fight Doom and seemingly killed both Quicksilver and Magneto as well as discovering she actually had no blood ties with the Master of Magnetism before forcing Doctor Doom to flee. In San Francisco, Captain America arrived to Iron Man's Stark Island where Iron Man introduced him to the reassembled inverted Avengers and Medusa willing to join forces once again upon learning Steve Rogers had assembled the Astonishing Avengers to stop them. Back to Manhattan, Zenpool kept trying to reason with Apocalypse. In the end, Zenpool was beaten and beheaded, thus defeated like the rest of the Astonishing Avengers. As Apocalypse claimed his victory, the gene bomb's countdown was almost finished. With the gene bomb's countdown nearly completed, Spider-Man attempts to stop it by smothering the device with his webbing, but Carnage interrupts, informing him that his efforts will fail, with the symbiote killer sacrificing himself to cover the device with his own symbiote. The bomb now disabled, Spider-Man and the Astonishing Avengers clash with the inverted heroes, Loki and Enchantress luring Thor away to another location as the fight continues. During the fight with Scarlet Witch, Doctor Doom was able to revive Doctor Voodoo who uses the spirit of his brother Daniel Drumm to possess Scarlet Witch in an attempt to defeat her. Determined to recover Red Skull from Avengers Tower, Steve Rogers dons a new exo-skeleton suit to confront his former successor, informing Falcon that he should stand down. Using the Red Skull's telepathy, Steve managed to distract Sam for long enough to escape. After Captain America's failure to get Rogers and the Skull, the AXIS set out to the Avengers Mansion after having defeated the inverted X-Men. As he was recovering from his defeat, Apocalypse is confronted by Zenpool and is convinced to fight against the AXIS. On the Moon, Loki was being chased by Thor Odinson around the Blue Area. Loki soon came across Mjolnir which had been left there since Thor became unworthy. He picked up the hammer and started fighting Thor Odinson with the power of Thor. Back to the Avengers Mansion, Steve Rogers and Red Skull are attacked by the AXIS right after arriving. Before Captain America could beat Steve Rogers to death, Apocalypse appeared and fought the AXIS while Red Skull was taken out of the location. The rest of the AXIS still managed to catch up with them, but were confronted by Spider-Man and Sabretooth while Steve Rogers tried to get Red Skull to a Quinjet which was soon taken down by Iron Man. Iron Man was about to kill the Red Skull when Doctor Doom, Scarlet Witch (who was possessed by Daniel Drumm), Magneto, Doctor Voodoo, and Quicksilver arrived. After Iron Man was incapacitated, Doctor Doom, Daniel in Scarlet Witch's body, and Red Skull began a reinversion spell. Unwilling to return to his regular self, Iron Man activated a shielding to protect himself from the reinversion as well as accidentally shielding Havok (who was also unwilling to turn back due to fear of dealing with the repercussions of what he had done, saying "I couldn't survive knowing what I have done") and Sabretooth. The reinversion was successful with every person affected by the inversion except the three aforementioned. After the spell, the still-inverted Havok used the Wasp as a leverage to escape. Magneto soon realized that due to the distraction, Iron Man, Doctor Doom, and the Red Skull had escaped. Carnage having been affected by the inversion now feels the need to do good while also controlling his murderous desires. He saves a prostitute from a man by punching him and accidentally punching one of the man's eyes out. Then another man runs at Carnage with a knife only to have his hand cut off by Carnage. The woman attacks Carnage much to his surprise and she points out the second man was her pimp. Declaring her to be a criminal to Carnage gently knocks her unconscious. But a crowd gathers saying that he attacked her despite his protests that he was saving her. Meanwhile, a new Sin-Eater is murdering journalists, which unscrupulous reporter Alice Gleason uses to try and boost her popularity. She also points out she wants the super hero beat an earlier, now dead, reporter had. But she can only get it if she "gets someone with a cape". Carnage watches her on TV outside a store. He watches her tearful display about the murdered reporters and says she is a good person and can teach him to be good. When she arrives at her home Sin-Eater is waiting for her. She tries to offer him fame and fortune but he refuses and then Carnage bursts in singing his own version of Spider-Man's theme song. He then blows off Sin-eater's head and takes away the fainted Alice. Sin-Eater reconstructs his head, a glowing green skull, a watches Carnage swing away. When Alice wakes up, Carnage has webbed her under a bridge and he tells her that she will teach him to be a good hero. Following his inversion, Roderick Kingsley returned to New York and found himself happier with his inversion, although still motivated by greed rather than altruism. He reactivated his franchises where he leases the personas and costumes of deceased or retired superheroes to ordinary people, but remained a wanted criminal. He also enfranchised his Hobgoblin persona to various people to perform heroic deeds as Hobgoblin and published a comic about them for promotion. Among those who answered an ad are Lily Hollister (who was rendered amnesiac after a botched rescue from the police by Goblin King) and an underemployed teenager named John Myers. He set a three phase program including a book and various articles with his brand and underground speeches named after Ned Leeds for people to make their own franchises in exchange for a share of their profits Hobgoblin debuted his Hob-Heroes which consisted of Lily Hollister as Queen Cat, John Myers as Missile Mate, Flower Girl, Leatherboy, Rocket Head, and Water Wizard. When Goblin King confronted Roderick Kingsley in his headquarters, Queen Cat came to his defense. Goblin King recognized Lily Hollister as Queen Cat, but she did not recognize him. Following the attack, Missile Mate was convinced by Urich's claims that the Hobgoblin would soon abandon the heroes he had trained. Missile Mate went to the Goblin Underground's headquarters and asked Goblin King to join him to be a supervillain. Goblin King was reluctant, but Missile Mate soon showed him that he had also gathered to join his cause all the supervillains that Hobgoblin had "abandoned" (consisting of 8-Ball III, Killer Shrike II, Melter III, Tiger Shark II, Unicorn IV) after becoming a good guy. When the celebration of a Hobgoblin Day was being held with a parade in Roderick Kingsley's honor, Missile Mate betrayed Hobgoblin and attempted to murder him in the name of the Goblin King. Roderick had already expected the betrayal and had been using a hologram decoy which took Missile Mate's blow. As soon as Roderick Kinglsey confronted Missile Mate, the Goblin King appeared with his Goblin Nation and attacked the celebration. Hobgoblin bested Urich in combat and left him to the authorities. After excusing himself from the authorities, Hobgoblin was approached by Steve Rogers to become part of a team of Avengers with the objective to stop the inverted X-Men from detonating a gene bomb which would've killed everyone on the Earth who wasn't a mutant. Following his inversion, a now altruistic Doctor Doom seeks redemption for his crimes. In order to combat a now-evil Scarlet Witch when she invades Latveria, with the help of Valeria Richards Doom forms his own team of Avengers consisting of 3D Man, Elsa Bloodstone, Stingray, Valkyrie, and U.S. Agent. It is later revealed that the fight was used by Doom to power a device to put right his previous mistakes; however, forced to choose only one act to repair, he chooses to resurrect the superheroine Stature, whom he had murdered in Avengers: the Children's Crusade. Magneto manages to recruit Deadpool to help fight Red Onslaught. After the inversion spell was cast, Deadpool had his pacifist personality take control of his mind and body. Thus, he becomes Zenpool. Magneto goes around to recruit some supervillains to help fight Red Onslaught. When Magneto arrived to recruit Hobgoblin, he attacked Magneto and was subjugated and forced to join Magneto's team. He approached Carnage in his self-confinement and convinced Cletus to join him as there would be nothing more chaotic than him saving the world. Magneto destroyed the Doombots which guarding a palace door and enter the castle. There, he finds Doctor Doom, Loki, Verity, and Valeria. He offers an alliance with Doctor Doom and Loki against with the Red Onslaught, which Doom agrees to. Thanks to Loki's help, Magneto was able to get Enchantress to help fight Red Onslaught. Gathered on the battlefield, Red Onslaught has unleashed chaos on the city: the inversion spell has flipped personalities and psychic attacks are controlling beings for his cause. Magneto, because of his helmet, and select other magical beings are immune. Amidst battle, Magneto has the idea to bring Professor X's conscious to the forefront of Red Onslaught, using Doctor Strange and Scarlet Witch. Doctor Strange is incapacitated, and Doctor Doom steps in. Red Onslaught becomes aware of this and sends Carnage to stop them. While Carnage is attacking Magneto, they successfully cast their spell and the battle ends. Magneto stands away in the distance and the psychic form of Professor X appears. Magneto tries to explain that Professor X was right and that he will meaningfully pursue protecting mutants like Professor X wanted. Professor X reveals that Magneto was right all along and that he was wrong. Magneto walks off to a group of young captured mutants, frees them, and assures their utmost safety. A German officer is seen watching and smiling in the background. Kluh was eventually confronted by Nova attempting to bite off Nova's arm before being blasted up the nose. Irritated, Kluh hit Nova so hard he crossed the Atlantic and crashed head-first into the Eiffel Tower. Kluh resumed his rampage. Iron Man was present in the Red Onslaught's concentration camp when the Scarlet Witch cast the inversion spell that finally defeated him. The day was saved, but now, he sees things differently. Flying over San Francisco, he delivers a mobile device app that gives the user free access to Extremis 3.0, along with instructions on how to use it to change your body into whatever you want. One week later, Iron Man teams up with She-Hulk on the streets of San Francisco. A kid has been exposed to gamma radiation, gained a monstrous visage and some super-strength, and has started wrecking the street and calling himself "Teen Abomination" (who resembles a teenage version of Abomination). Iron Man starts lecturing the new villain about the importance of branding, but he is met with a blow that takes his head clean off only for Iron Man to reveal that he is controlling the armor remotely. Teen Abomination is stunned by the revelation long enough for Iron Man to incapacitate him with a uni-beam. In the aftermath, She-Hulk lectures Iron Man about using too much force, and vocally disapproves of his callous behavior. From his swimming pool, Tony sends a remote recall signal and the armor returns to the lab. Pepper Potts comes to the pool and tells Tony that she needs to talk to him in private. Tony says he will meet her inside. An hour later, he saunters in rather than immediately. Pepper notices that he has started drinking again. Tony shows her the latest Iron Man suit, which is going to replace the Model 42: the Endo-Sym Armor. A liquid smart-metal design, it utilizes elements of symbiotes and its boot process is fully psionic. Pepper cuts out his spiel about its aesthetic appeal by accusing him of not considering the ramifications of giving everyone with a smartphone access to Extremis. Everyone who had no way of accessing the app is the city's new underclass, while everyone who had access to the app has become part of a wave of orgiastic irresponsibility that has swept the city. On a street corner, a gang of Extremis-enhanced urbanites corner a homeless woman and accuse her of blemishing their perfect future. Before the second punch is thrown though, they are accosted by Daredevil who promises violence if they don't disperse. Suddenly, the leader of the mob keels over in pain. People around the city do the same as Tony explains to Pepper the second part of his strategy to leverage Extremis to provide Stark Industries (as he still calls it) with a large amount of money. Every single Extremis enhancile in San Francisco writhes on the pavement as their biology subtly rewrites itself to default. Every single mobile device in the city pings explaining through a new message that their trial period has expired, and that to continue, they must pay $99.99 per day. Putting on his Endo-Sym Armor, Tony decides to get a good look at the city from the air. That night, Pepper discusses Tony's condition with someone. She says that years ago, Tony said his greatest fear was not that someone would take the contents of his life and use it against him, but rather that something would take his mind, and use him to destroy his life. Pepper believes that this has happened and that she and her co-conspirator need to activate "the contingency." Her ally steps from the shadows revealing that the unnamed person is wearing an early Iron Man suit as he agrees with her. In the wake of the conflict, New York City is being rebuilt for what was an estimate of months. The press receives a video which had been recorded by the inverted villains before the battle in which they blamed the recent crisis on themselves calling themselves the "Axis of Evil." Steve Rogers is recovering from the wounds suffered during the battle. Iron Man has returned to Stark Island in San Francisco. Havok returned to Cyclops's X-Men. Deadpool and Evan Sabahnur have gone into hiding. Thor is still dealing with no longer being worthy. Doctor Doom has abducted the Red Skull and is holding him prisoner. The Avengers Unity Division has reformed. Peter Parker is building the rhinestone statue Carnage made Spider-Man promise was going to be made when he sacrificed himself. Sabretooth is imprisoned promising to follow a better path in life similar to Wolverine's path now that he is permanently inverted. 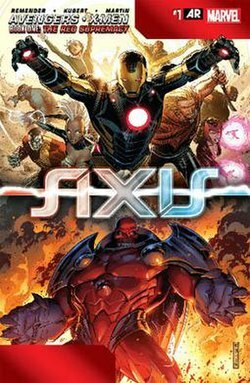 IGN gave the story and the overall graphic novel a negative review of 4.5 with the verdict "AXIS stands as one of the great disappointments of 2014. Despite the top-tier creators involved and the pedigree of Uncanny Avengers, this event just didn't come together. Only sporadic moments of fun crop up during the barrage of rushed art and poor characterization. And while the overall pacing does benefit slightly in this collected format, the hardcover's lack of extras and poor paper quality make the high cover price a hard pill to swallow." ^ Schedeen, Jesse (May 21, 2014). "Marvel's Next Event Comic is AXIS – An Avengers/X-Men Team-up". IGN.